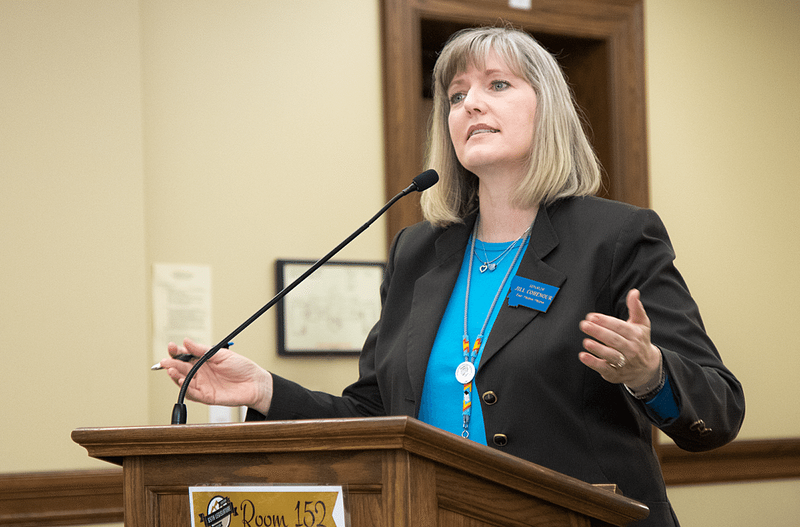 HELENA – With the special congressional election quickly approaching, Montana lawmakers heard heated testimony a bill last week that would allow counties to opt for mail-in ballots. Senate Bill 305, introduced by Sen. Steve Fitzpatrick, R-Great Falls would just apply to the upcoming special election between Republican Greg Gianforte and Democrat Rob Quist – both vying for the congressional seat vacated by now Interior Secretary Ryan Zinke. “This election is going to be very expensive, and it’s going to be an incredible burden on your local taxpayer,” Fitzpatrick said. Fitzpatrick said county governments could save as much as $500,000 to $750,000 by using an all-mail system. He also said many places typically used for polling may not be available during the special election, and this could prevent many from voting at all. Fitzpatrick addressed the controversy surrounding SB 305, which was sparked when GOP Chairman and Billings Rep. Jeff Essmann voiced his opposition to a mail ballot-only election due to his belief that Democrats have an “inherent advantage” in such elections. The bill attracted nearly 60 supporters, many of whom were election officials and county commissioners. Supporters echoed Fitzpatrick, saying a mail ballot election would be a significant cost-saving measure. 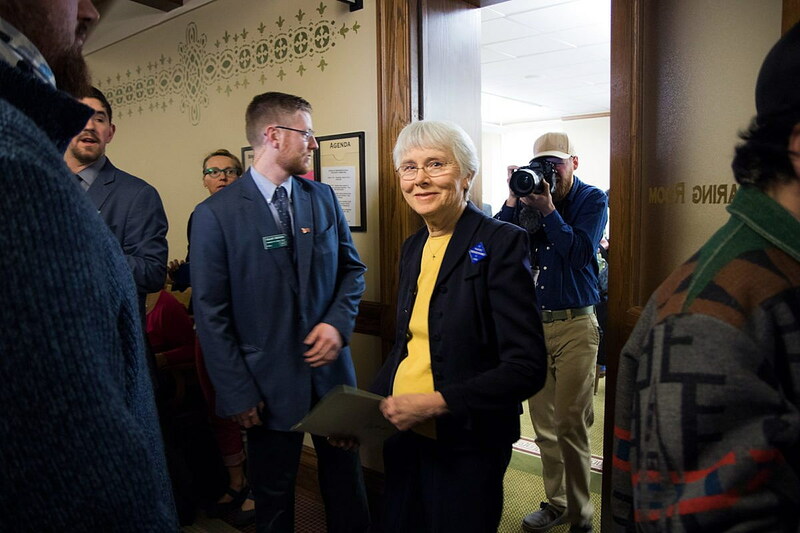 After supporters of the bill ran out of their allotted time to speak to the bill, Helena resident Carole Mackin was escorted out of the room by the sergeant-at-arms after refusing to stop delivering testimony. Opponents of the bill argued there was no reason to change the way the state conducts its elections, and that doing so could jeopardize the integrity. Several opponents spoke on behalf of Native American tribes, saying a mail-only system would prevent many tribespeople from voting due to often significant distances to post offices. A bill that would prevent local governments from regulating agricultural seeds passed the House last week on a 70-30 vote. Senate Bill 155, introduced by Sen. Mike Lang, R-Malta, will only permit the state to set regulations on seed sale and production. The bill was carried on the House floor by Rep. Alan Redfield, R-Livingston. Supporters in the House said the bill was a common sense measure, and that it would prevent counties and local governments from meddling with what farmers choose to grow. “This bill will give certainty to an industry that doesn’t have a lot of certainty,” said Rep. Walt Sales, R-Manhattan. The bill drew 10 supporters during its first reading in the House Agriculture Committee. Many of those supporters said the bill would prevent additional regulation an on industry already overburdened with existing rules. “Agriculture is already one of the most heavily regulated industries out there,” said Chelcie Cargill, representing the Montana Farm Bureau. Opponents of the bill argued counties do not unfairly regulate, and that the bill could have adverse effects on how counties regulate noxious weeds. “There may be an intent on this bill to do one thing, but it is leaving a potential problem for counties who want to regulate noxious weeds per the listing on the county noxious weed list,” said Rep. Willis Curdy, D-Missoula. Redfield said the bill would not affect weed regulation due to weeds not being considered viable seeds for production. The bill will be sent to Gov. Steve Bullock for his signature or veto. A bill that would allow for limited spearfishing in Montana was heard by the House Fish, Wildlife and Parks Committee last week. Senate Bill 214, introduced by Sen. Jill Cohenour, D-East Helena, would allow for underwater spearfishing in waters designated by the Department of Fish, Wildlife and Parks. Cohenour said the bill would only allow for spearfishing in areas where fish can legally be taken, since spearing a fish would kill it, therefore preventing it from being released back into the water. The bill also prevents spearfishing near docks and water skiing areas to avoid unintentional injury to swimmers. The bill passed the Senate 44-6 in February. Eileen Ryce, fisheries division administrator for the Department of Fish, Wildlife and Parks, supported the bill. “[We] will work with constituents to select an appropriate water or waters for spearfishing,” Ryce said. Bob Gilbert, a lobbyist for Walleyes Unlimited, a sport fishing interest group, opposed the bill. Gilbert said he was concerned about spearfishers overfishing endangered species, arguing that they would not be able to determine the breed of the fish underwater. “When you’re underneath the water, spearfishing happily away, how do you know how long a fish is?” Gilbert said. The committee didn’t take immediate action on the bill. The House Human Services Committee heard a bill last week that would allow for licensure of eating disorder clinics. Introduced by Rep. Alan Redfield, R-Livingston, House Bill 572 would allow for licensing of clinics that provide intensive outpatient and inpatient treatment for patients with bulimia, anorexia and other eating disorders. Redfield said his daughter suffered from an eating disorder, and eventually recovered. “You cannot grasp the seriousness of this until you know someone who’s affected,” Redfield said. The bill drew no opponents. Jeni Gochin, program director at the Eating Disorder Center of Montana, said current licensing does not provide for intensive inpatient treatment or partial hospitalization. Gochin also said many patients must travel out of state to receive proper treatment for their eating disorders, the costs of which can often reach into tens of thousands of dollars. Laurie Thatcher, a Bozeman mental health professional, said she suffered from an eating disorder while she was a competitive athlete. “Having to go through this experience out of state, away from my normal life, was very difficult,” Thatcher said.